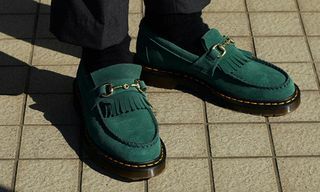 Though many argue that authentic subcultures are dead and gone, their spirit still thrives deep within the stitches of Dr. Martens, a brand that’s been affiliated with dozens of niche coteries throughout its 69-year history. 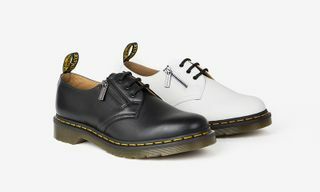 Founded on traditional cobbler techniques dating back to World War II, the storied British label went from being a blue-collar footwear staple, to the defining sartorial element for everyone from skinheads and punks to goths and grunge rockers, thanks in part to the shoe’s pragmatic construction, aggressive aesthetic and deep-rooted English heritage. 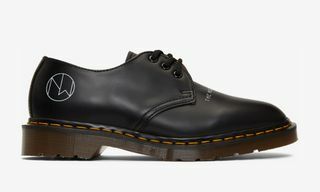 While the popularity of the shoe has reached an all-time high, Dr. Martens’ company philosophy firmly harks back to its subcultural influence and devotes its progression to the many tribes who’ve contributed to its success. Recently, I was invited to tour the brand’s original factory on Cobbs Lane in Northamptonshire, England. Peep the photos above for an exclusive look inside of the factory and uncover more about its history below. When was the factory first established? The oldest part of the Cobbs Lane shoe factory dates back to the 1870s. 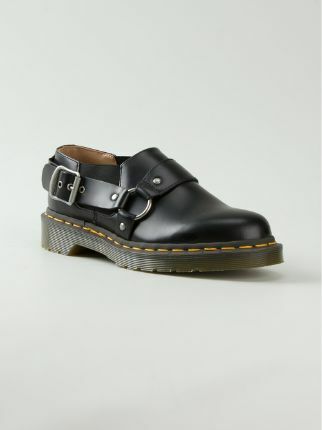 But it has been making Dr. Martens since the brand launched in the UK in 1960. Pre-Industrial Revolution, many shoemaking operations were carried out in the homes of villagers and brought to the factory to be finished off. The part of the factory where the very first pair of Airwair 1460’s was made (April 1, 1960) is now the sourcing office. The factory extension was added in 1990. How was this location decided upon? The Griggs family owned the shoe factory for generations before launching Dr. Martens. The factory has been here for so long that the street is named after it. Cobbs Lane is a reference to the British slang for shoemaker or “cobbler.” Northamptonshire is the heart of the British shoe industry. When the brand relaunched the original factory almost a decade ago, it made sense to manufacture the most premium ranges of Dr. Martens here in our original factory. What models are created at this particular factory? All of the originals were created here back in the day. 1460, 1490, Church and Capper boot and the Adrian, 3989, 1461 shoes all started life at Cobbs Lane. The Steed shoe and the Pascal boot were refined from these originals more recently. There are new styles in the premium “Made In England” range every season which are based on our heritage products and on innovative new patterns. How has the evolution of Dr. Martens shaped the way you manufacture the actual shoe? 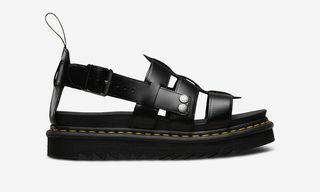 The unique process of attaching the sole to the welt is still quite a departure from other manufacturers in the last 56 years since it was invented. Because we’re using unique machinery to perform this task, we tend to approach a lot of other processes from a different angle than most. We’re always looking to push the old ways in new directions and sometimes we reverse the engineer depending on what we want and what the equipment or the materials are capable of. We’ve made high-end shoes featuring performance components and welted shoes that could be mistaken for a completely different construction. How many shoes do you churn out on a weekly basis? The Cobbs Lane factory makes only around 1% of the brands total output. We manufacture 1,200 pairs a week. The styles we make are a mixture of the “Made In England” collection, collaborations (we work with other brands such as COMME des GARÇONS, Norse Projects and OFF-WHITE) and bespoke products which are tailor-made for customers who have visited our Carnaby Street store. Which silhouettes (created at this particular factory) are your most popular? 1460 and 1461 are the crown jewels of the brand. We make the vintage versions here at Cobbs Lane all-year round. We also make those silhouettes in seasonal variants (we’re making them in black pebble and various colors of arcadia rub-off leather). All of the classics collection (there’s a Pascal boot, a 1461, a Steed, an Arthur boot and an Les boot) are specific to Cobbs Lane. 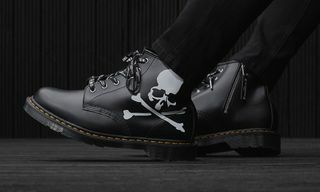 How often do heritage silhouettes re-emerge from the Dr. Martens archives? Heritage runs through this brand almost as strong as innovation. We have an enormous archive of previous styles which we revisit regularly. It’s often used as inspiration for our own range and when working on capsule collections with other collaborators. 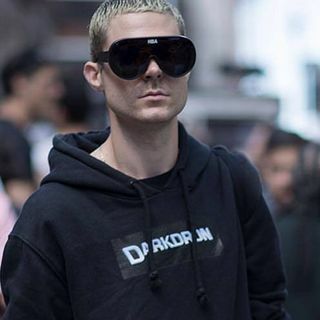 COMME des GARÇONS, for example, is a big believer in digging around in the back catalogue to find a pattern that’s fallen from view and due for a resurgence. Products like the 1914 and the Capper have their moments in the sun but never really go away completely, but something like an Les boot or a Church boot was off the radar for a very long time, but has since come to the fore massively in the last couple of years. Has the factory withheld the same employees for a number of generations (more or less)? With a company so deeply rooted in shoemaking tradition, I imagine you have people who are very loyal to the brand. The staff turnover in the factory is very low. We have people working here whose parents and grandparents have worked for Dr. Martens. Not a month goes by where we aren’t rewarding or recognizing someone’s length of service at Cobbs Lane. When we interview young people for our apprentice positions, we hear about grandmothers and grandfathers who were shoemakers for us in the past. It’s very inspirational. There’s definitely a Dr. Martens type of person. Brand loyalty is stitched into the shoes. We all wear them, we all buy them. Why do you think Dr. Martens has resonated with so many subcultures throughout its history? It’s a combination of things. 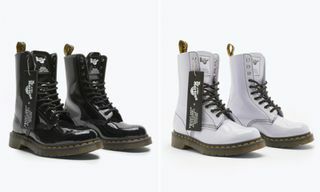 First and foremost, it’s about the product, its function, comfort, durability, utility and the fact that our iconic 1460 boot is a blank canvas that, for decades, has been subverted and replayed by diverse range of consumers, musicians and free thinkers as a symbol of rebellious self-expression, personal style and identity. Secondly, it’s because of the authenticity of the brand, which is something that consumers trust. Lastly, it’s about our deep-rooted connection to music and youth culture. Music is our heartbeat and it’s fair to say that without it, we would have just remained a humble workwear footwear brand. What is Dr. Martens’ brand ethos? We’re all about creating footwear that empowers self-expression through the consumers’ creative personal styling of our unique product. We do this by rigorously upholding our design principles, rich social and musical heritage, people diversity and non-conformist attitude. In other news, check out Dr. Martens’ recent collaboration in VETEMENTS’ SS17 collection.